The sequel to the successful reboot of Star Trek has been a long-in-development priority for Paramount and director J.J. Abrams, and the Enterprise is currently scheduled to lift off again this January, when shooting on the untitled next installment will begin. 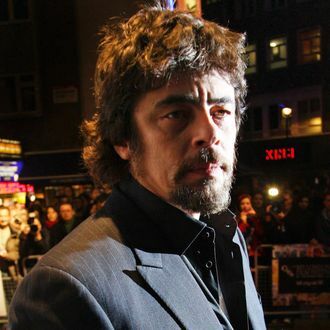 Sadly, there’s one high-profile star whom Abrams didn’t manage to beam up: Benicio Del Toro, who entered into talks last month to play the sequel’s new villain. Insiders tell Vulture that the deal actually went asunder last Wednesday after parties couldn’t come to terms over monetary issues. Abrams will now have to move quickly to fill the role, but which villain from Star Trek lore has he made the focal point of the new film? When Del Toro’s name was first linked to the project, speculation ran rampant that he might play Khan, immortalized once before on the big screen by Ricardo Montalban in Star Trek II: The Wrath of Khan. On Friday, the site Latino Review claimed to have confirmed that choice of villain, though Abrams promptly replied to Hitfix that the report was “not true.” Still, the famously secretive director was probably trying to keep the cat in the interstellar bag for a little while longer, as Vulture hears from a highly placed source that Khan is indeed the film’s baddie. Perhaps Abrams was taking his cues from Man of Steel director Zack Snyder, who strongly denied to the press last year that General Zod would be the villain in his Superman reboot … then cast Michael Shannon as Zod a few months later.